Looking to get in contact with us for some questions? We got to sit down with Break Away Tribe and share a bit of our story and a bit about our future with Shellmate Island! Break Away Tribe is such a cool place to read about other stories of people breaking away into alternative lifestyles! Lauren Smith from Master your Mind, Business, and Life reached out to us after seeing our Facebook post about WindStorm products! In this podcast we talk about out lifestyle and our transitions into tiny living as well as our next adventure with Shellmate Island! Enjoy! Aol reached out to us to include us and Tiffany on their series called “Dream Big Live Small”. It was really cool being able to show our home and a little bit about ourselves. The video is a must watch and make sure you check out the other episodes about other tiny house dwellers! Check it out! Business Insider asked us to lay out the good, the bad and the ugly of the tiny house movement. Here we shared what unique challenges we’ve faced in going tiny. We also share what benefits we’ve enjoyed since making this lifestyle change! MindBodyGreen asked us about our own financial and mental health and how they’ve changed since going tiny. We also touch on reducing our environmental impact and the changes we made in preparation for this lifestyle change! Wayfair asked us for our best tiny tips! We dissect the high efficiency of tiny homes and making the best use of your space. We love tiny homes that reflect the people who live in them, and Wayfair lays out how to create your space around your needs! 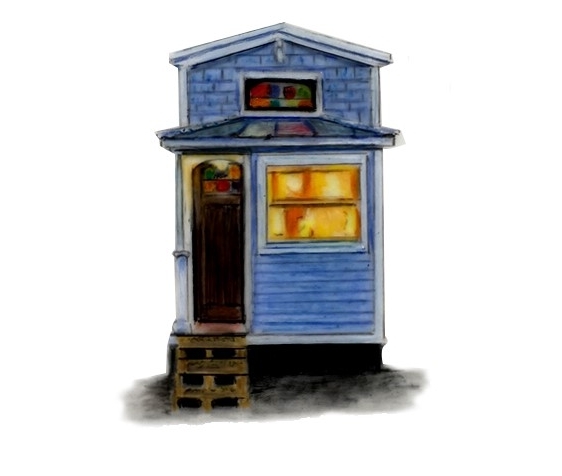 We worked with Reform Life in their series of stories about tiny house dwellers. We share our decision making process in going tiny and highlight the realistic possibility for others looking to make the change. We had the great pleasure of working with our friends at Tiny Houses and Beyond, where we shared our story of preparing for Hurricane Irma in 2017. This was an anxiety filled period, and we talk about the steps we took to keep our home safe when the hurricane was closing in on us. Take a peek! Tiny House for Us featured us in this post where we highlight the design and architectural features in Tiffany. Tim gets to talk about all the technology integrated within our home (his favorite thing). We had the pleasure early in our tiny house journey to team up with Alan at Dream Big Live Tiny Co. Alan asked us why we decided to make the switch from a traditional home to this tiny lifestyle! The legendary RoomPorn. We remember following this website’s social media since we signed up for Instagram. Who would have thought several years later we would be asked what life is like living in a tiny house! Eek! Our first podcast let alone “The Tiny House Podcast” out of Oregon. We covered living in Florida, our experience with the hurricane, and living in an RV park. We had such a great time doing this podcast but it’s always weird to hear your own voice! We had the chance to share our alternative lifestyle with the Jellyliving readers. We cover the challenges we face living the way we do, and all the benefits of this lifestyle. We shared our story in hopes of helping at least one person in making the decision to go tiny. Tiny House Talk found us in the beginning of our tiny home journey. It’s fun to look back on this interview and see how our answers to these questions have changed. We love sharing details about our home! Cummins Architecture and Design wanted to learn more about our tiny life. We share details about our relationship and our habits, and how these things have evolved since going tiny. We share our tiny dreams and how much we love the design of our home. Space Optimized put out a lovely interview with us where they delve into minimalism and what that looks like for us. They also go over the craftsman detail in our home. Maybe we’re biased, but we could look at the photos all day! Our friend Kendra reached out to us for an interview Helga Marie, and we were happy to oblige! She wanted to know what the conversation between us looked like when deciding to go tiny. She also covers minimalism, downsizing, and what advice we have for others looking to go tiny! First For Women reached out to us for their piece on tiny living. This is a great article that explains why and how young couples are choosing this lifestyle, and the different designs and layouts of some gorgeous tiny homes. Pes Descalcos included us in this great video about the builder of Tiffany, A New Beginning Tiny Homes. Funny story, when Tim went to show his mom Tiffany for the first time, Isabel and Robson were there checking out Tiffany for their own eyes during their holiday in the United States. This is one of our favorite videos of Tiffany because you can feel the quality and thought brought into the build in Adam’s words! Leanne Stephens is the author of the award winning blog Tiny Houses and Beyond, author of the tinyhouse cookbook “Cooking in Small Spaces.” Leanne reached out to Sam after reading her step-by-step blog post about her adventure in the Kombucha making world and included it in “Cooking in Small Spaces”! There are tons of other great recipes from tiny house dwellers around the globe. We always like to pull this out when we want to try and make some new home cooked nom noms! If you ever watched HGTV when Tiny Paradise show first came out then you saw the commercials that aired about every 10 mins with Tiffany plastered all over the TV screen and magazines. HGTV took Tiffany to Key Biscayne Beach in Miami in order for her to get a little tan on the beach and stretch her legs out! Watching and seeing these ads will never got old for us of course!